I've been pondering over this project like forever and I finally did it! In order to make the awesome, antique spoon rings, I need to cut off the "bowl" part of the spoon (I only recently learned about the "bowl" because I googled it - gotta love google!) Anyway, I had a box filled with these spoon bowls and I had the idea to make men's jewelry with them and I finally took the plunge and began making bracelets. Now, these bracelets are not just for men alone. They can most certainly be worn by women, girls and tweens as well. I'm definitely gonna make myself one. 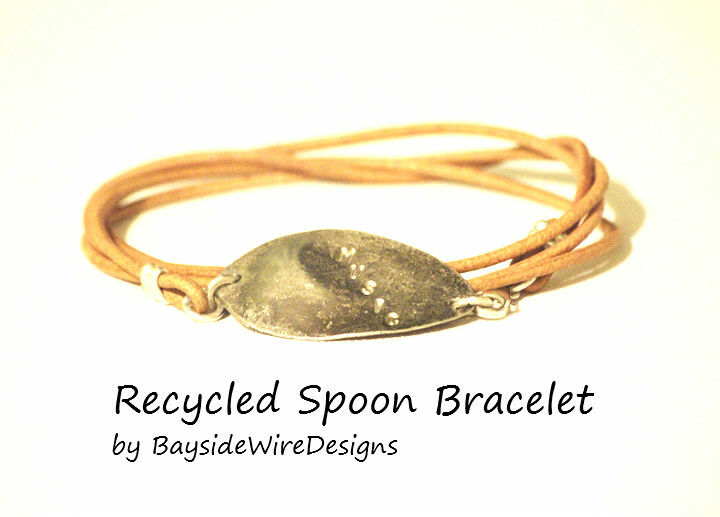 What I like about the bracelet is the rugged look and most of all the recyled parts of old, antiqued spoons! What else could you ask for in a great bracelet!! I finish off my bracelets with .925 sterling silver matals (the clasp, the rings and the large crimps that I made). Another really cool thing about this bracelet is the design of the bowl itself. I went a little hammer crazy and decided to add texture to a large part of the spoon and leave a section untouched as to add a bit of contrast with texture: smooth against the hammered! There are four strands of gorgeous, natural leather that just finishes off the bracelet beautifully! Rugged and Rustic is what you get with this unique style of bracelet. Like this bracelet is not already awesome enough, I added something to give it just a bit more Oumf! I hand stamped the work "music", which means this would make a great gift for that special someone who plays the guitar, the saxophone, the harmonica, the banjo, even the spoons. Click here to get more info on this great unisex bracelet.